It finally arrived: the weekend the ladies in my family look forward to all year long. Sisters' Weekend! Recap: I have 5 sisters and 4 brothers. 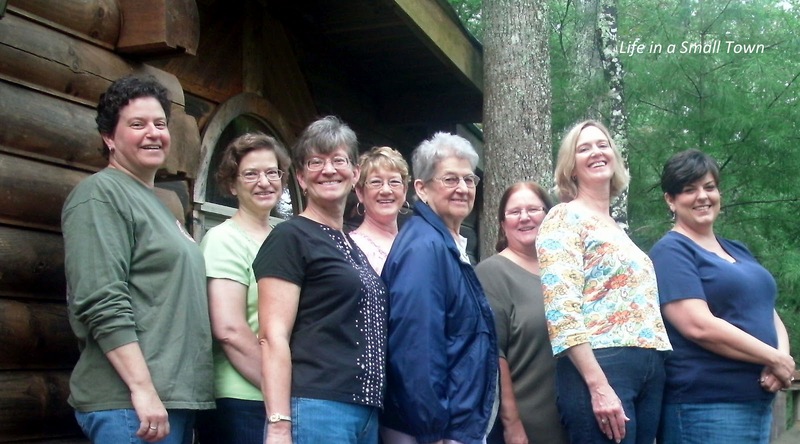 Every year, my mom, sisters, and sisters-in-law have a getaway in the mountains. no husbands, no kids; just us. I'm not sure how long we've been at it, but it's always a good time. Most of us make it every year, but there hasn't been a year that everybody has been there. Maybe one of these years! We stayed in the same cabin as last year; it's out in the middle of nowhere, so we don't have to worry about how loud we are. There's a lot of talking and a lot of laughing. We have a rule: what is said at the cabin stays at the cabin. We pair up and take care of the meals. 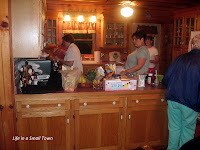 Friday night, we had hotdogs, potato salad, baked beans, and S'Mores for dessert. The original plan was to have a fire in the fire pit, but the pit turned out to be a little disappointing, so they ended up using the grill. We read, we talked, and we laughed. One of my sisters proclaimed Saturday as "pajama day". My oldest sister said that she had never had a "PJ Day" before, and it was a perfect day for it. It rained most of the day, so we stayed in and read more and watched football games. Oh, and we ate. For breakfast we had an eggs benedict casserole & fruit...and mimosas. For lunch we had a "Layered Summer Pasta Salad", then for dinner one of my sisters grilled steaks, and we had potatoes, salad, and a reduced calorie banana cream pie that was to die for! Sunday morning we packed up and went to a local restaurant for breakfast. These weekends are just the best. My oldest sister & I discovered that we wake up at night at the same time to push the covers off: 3:00. Weird, huh? Also, I found out that the problem I have with the heat migraines (that made me give up tennis) are shared with that sister, along with another sister. The bad thing about having such a great weekend is that it comes to an end. Tomorrow is back to reality. Sounds like so much fun...I'd love to do this with my sisters and sister in laws! I'm glad you had such a good time. I think it's fantastic you all keep doing this. Good for you! Mary, this is such a great tradition that you all have. I bet your mama just LOVES it! the family that plays together, stays together! Good going!!! Sounds awesome!!! What a fun thing to do! I'm envious of your large, wonderful family!!!! Hard to believe it has been a year already. Sounds like a wonderful time. What a great tradition!